Built on the basis of the legendary Mitras LX6 series, the LX 7 offers perfectly matched LEDs to provide the most complete spectrum available. The LX 7 comes in a sleek and modernized design and offers unmatched light output, superior color blending, and extreme light spread. We’ve implemented even the smallest of details to make the LX 7 the most powerful and energy efficient LED fixture on the market. Equipped with the latest in LED technology, the Mitras LX 7 provides outstanding light performance and efficiency. LX 7206 includes 72 specially selected high-power LEDs (Cree©, OSRAM©, and SemiLED©) in 9 independently controllable channels providing at least 150 lumens/watt. 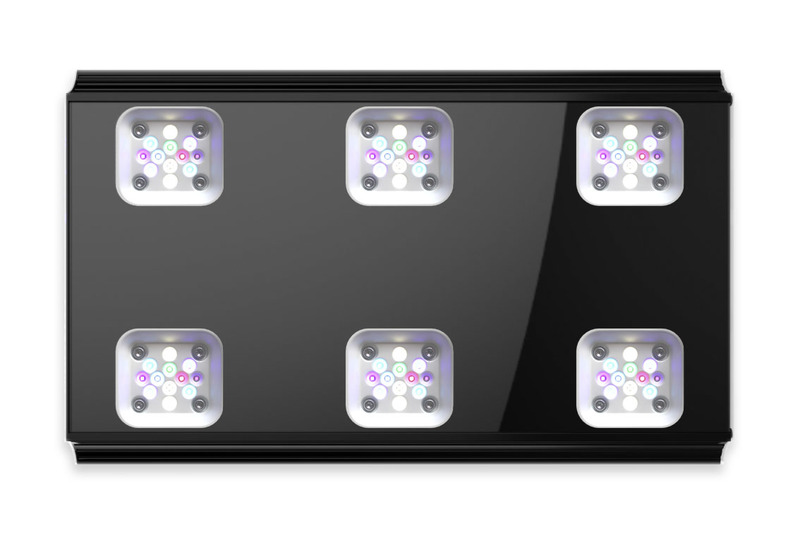 These high-power LEDs are specially mixed and tuned to provide increased coral coloration, increased growth, maximum even-light distribution, and brilliant true-to-life colors (CRI > 95). The Mitras LX design makes it user serviceable; LEDs are integrated in 6 replaceable LED clusters. 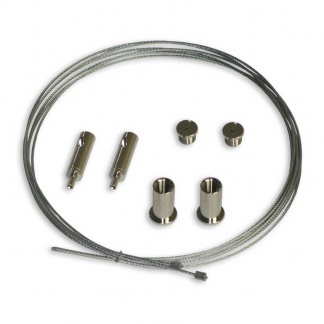 When it comes to maintaining light intensity for deep tanks, most current LED Lenses fall short. For tall and short tanks, these type of lens may even cause a “Disco Effect” due to the way multiple LED light colors are blended by the lenses. Our metal coated high performance LED reflector mimics the reflective performance of parabolic Metal Halide reflectors reflecting 99% of light. 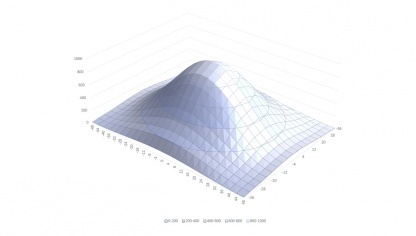 This type of reflector design maximizes light efficiency, increases light spread, optimally blends LED colors, and minimizes light loss the deeper light penetrates. All Mitras series LEDs include a microprocessor-controller that continuously monitor LED temperature and ensures safe operation and maximum light output with high energy efficiency. If the system detects LED temperatures above the optimal range, the microprocessor will automatically adjust the temperature-controlled fans to ensure continued optimal operation. Automatic brightness reduction is another feature which adds an extra layer of safety. 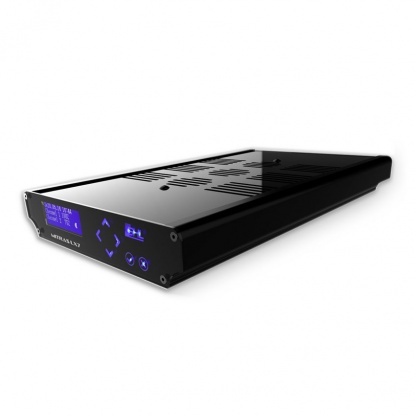 Connect the Mitras LX 7 via the cloud (myGHL©), your smartphone, or your computer – built-in Wi-Fi and USB connection provides you with all the connection options you desire. The Mitras LX 7 includes a second RF module which works independently from Wi-Fi which allows you to link multiple Mitras LX in master/slave modes. Mitras LX 7206 has 6 clusters for a total of 72 LEDs. 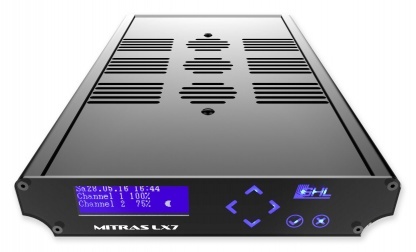 Looking to control the Mitras LX7 off of a ProfiLux 3 or 4 controller? 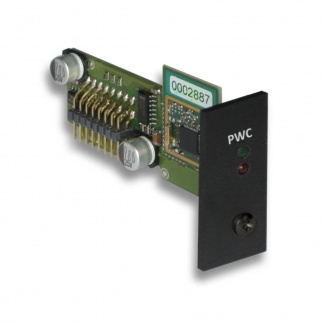 Make it happen with the PLM-PWC expansion card for ProfiLux 3 and 4 controllers. * Hanging Kit not included!